This is usually done from a day old bread that remains after making some sandwiches or other bread dishes. In the above picture I haven’t used coriander leaves and coconut, but if you add both or one of them the taste will increase. Heat oil and add mustard, cumin seeds, urad dal. When they start popping add curry leaves and chillies. Add onions and fry till they turn brownish. Add bread pieces and mix well. Add sugar, coconut and salt. Mix well. Tried this today for breakfast. Both my husband and me liked it! Good one! Was browsing for recipes and landed on your blog site. Awesome site 🙂 !! Loved this recipe and tried it for breakfast today. dissolve salt,sugar in quarter cup buttermilk and mix bread pieces thoroughly n then keep aside. heat oil,add the above things alongwith boiled potato pieces and the ready bread pieces,coriander leaves and mix well.cook for few minutes. I had tried this recipe once before but it came out too dry(i tried without coconut). thought of sprinkling some water but was then didnt do it because i didint want to make a paste upma. any suggestions?? 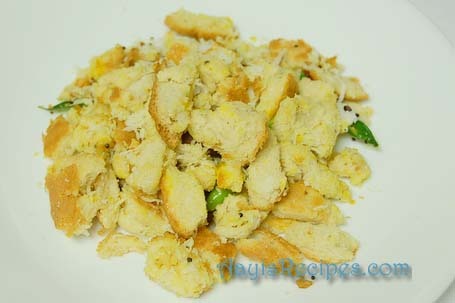 Shilpa: Cut bread into small pieces. Also, sprinkling a handful of water does not make it a paste. Do not fry for too long after adding bread. can v add tomatoz.. in the form of puree or sumthing?? Shilpa: I usually don’t add tomatoes. But you could add if you wish to. Instead of making pieces of bread, other option is to coarse grind the bread in mixer. I make it almost the same way too ,with a few variations. Don’t add udad dal and mustard but only jeera. add a little bit of chilli powder too…..
It’s an all time favourite of the family…….. I tried this recipe today â€¦awesome. Just to make it bit healthy, sprinkled wheat bran and instead of coconut used lot of corianderâ€¦.high fibre â€¦yummy good break fast. Shilpa I visit this website many a times, very brilliant breakfast ideas. Thanks. When do you add asafoetida??? ?